Some argue – within and without Westminster – that if Jeremy Corbyn were prime minister, then the UK would be left alone chartering waters no western country should ever attempt to enter. Yes, liberal pundits’ criticism of him has gradually dwindled after June 8 but the Labour leader’s plans for Europe still ought to be gone through with a fine tooth comb. This is the place in which Labour finds itself. At least as seen from afar, that is Europe. Having lost millions of voters in northern England, Wales and Scotland in between 2010 and 2016, the red party has started doing “patriotism” a bit more. It would be very worrying if it were not so. It’s a card one has to play, given the circumstances. Make no mistake: Machiavelli would pat you on the back for doing that. Whatever it takes, so his lesson goes. Besides, it’s not as if a dash of mild jingoism was ever alien to Labour throughout its history – Hugh Gaitskell was never enamoured with Europe either, after all. Occasionally, as we all know, the centre of politics shifts, and momentarily weaker outfits are forced to follow the changes – the zeitgeist. It happens everywhere. In Britain, the centre has moved towards the right over the past seven years (with Ukip’s crucial help), and you would expect social democratic organisations to do something to counter this while playing along to the new tune for a bit and sneakily carving out a new space. In this sense, Corbyn is playing politics by the book. You would be tempted to give him full marks on this subject. Yet, there is still something that doesn’t add up. Consider first: both Ed Miliband’s and Corbyn’s Labour have repeatedly and correctly denounced austerity as being unnecessarily harmful. The British eventually did pay attention to this message, but Labour still didn’t win power, leaving the party clutching at straws. Hence its somewhat desperate – remember the red immigration mugs? – pursuit of a rightward-moving centre. This is understandable. In national politics, you can only win if you grab the centre firmly. Even Corbyn, in his own way, is sticking to this age-old, unwritten rule although he doesn’t say it aloud. So, what’s a bit off then about Labour’s current tactics? They stem from Corbyn’s endorsement of Theresa May’s aim on Brexit – a hard departure from the EU. Article 50 was triggered without batting an eyelid in parliament. Recently, when interviewed by Andrew Marr, the Labour leader basically confirmed what seemed to be his dislike of the EU. 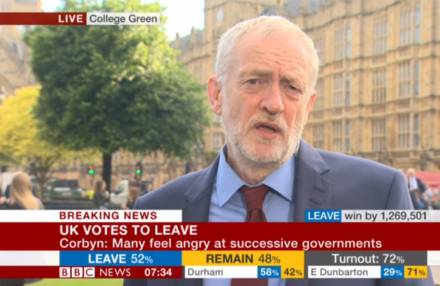 Is Corbyn dreaming of a near-communist Britain, finally free of EU ties? A pure land? This could be either dangerous or absolutely brilliant. In trying to dodge the Brexit raging bull as best as he can, he is also thinking what he must do next. It is not an enviable situation to be in. These days, after the recession, it’s as though you have to appear to be a national hero promising to rescue the country from dire straits. It’s very tricky. The plot also requires an external enemy. France and Germany are passé. The EU and the eastern European bloc feel more modern, while at the same time encompassing a bit of anti-French and German resentment for good measure. Updating old stories is always good, just like Disney does with the Brothers Grimms’ fairytales. Corbyn’s current efforts follow that stance and appear to be geared towards proving that the EU is against social democracy, despite evidence to the contrary. The Independent‘s economics editor Ben Chu recently argued against this by putting forward various examples of thriving, long-lasting projects across Europe that are informed by left-leaning policies, but some on the left still see the bloc as a capitalists’ club. This could explain why Corbyn is not holding a hand out to EU citizens: freedom of movement, being in his view a neo-liberal construct, is harming all ordinary citizens. Everywhere. EU citizens in Britain and Britons in Europe alike. Not quite convincingly. Freedom of movement might not be perfect, but is still better than any other arrangement Europeans were forced to abide to before. How many young people, from very ordinary backgrounds, enjoyed the chance of working and learning in another country? Isn’t this kind of Europe better than any we had in the past? Shouldn’t Labour support this? So, this is the only aspect Corbyn and company have not managed to shed a proper light on. The millions of people whose lives straddle British borders can’t stay in limbo for much longer. They contribute to Britain’s success but also need to plan. Despite national intricacies, one would have thought that the Labour leadership could be a bit more forthcoming on this. Why not propose to grant citizenship a bit more easily for those who have spent enough time in Britain (instead of asking to fill in 85 pages or so with the sole aim of catching one out)? And what about fighting at EU level for those Brits who want to remain EU citizens? Without an EU citizenship you miss out on local public administration job opportunities or face delays when having your qualifications officially recognised. No small matters; and yet Labour has virtually been silent on this.